Sunridge Woods is an established estate of 3, 4, 5 and 6 bedroom vacation and residential houses, built around small lakes in a woodland environment. 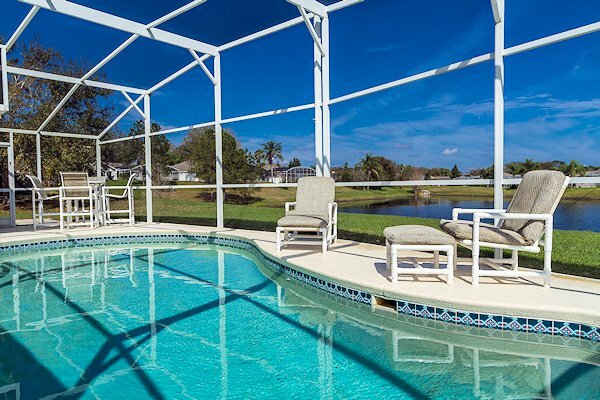 Situated on over-sized plots for added privacy, villas in this community provide peace and quite away from the hustle and bustle of the theme parks - with just the local bird-life to keep you company when relaxing by the pool. For golfers there are a number of first rate courses in the local area, which should allow you to make an early morning tee time. Sunridge Woods is located around 7 miles north-east of the intersection between Interstate 4 and US27, which is where you will find the Posner Park shopping complex. This offers major stores including JC Penney, Target, Ross, Dress for Less and many more. There are also a selection of restaurants around this section of US27 and and a British tavern. Closer to the community is the ChampionsGate area, in which there are a number of restaurants and eateries including Chilis, La Crepe, Subway, China One (take-away), Pizza Hut, Dunkin Donuts, Wingstreet and other eateries. For finer dining and a relaxing evening, there is the Omni resort itself. The nearest supermarket is Publix, which is also located in ChampionsGate. There is also a Walgreen's pharmacy and a 7-Eleven one-stop shop. The nearest Walmart is around 13 miles south towards Haines City or around 15 miles towards Kissimmee alongside Medieval Times. This is also where you will find the countless restaurants, bars and eateries along the US192 and SR535 towards Walt Disney World. Sunridge Woods is located close to Interstate 4, which also offers the most straightforward driving route to Walt Disney World and Kissimmee. An alternative route is via Old Lake Wilson Rd towards highway US192. For Universal Studios, SeaWorld and the International Drive area, head further north towards Orlando. Orlando International airport is accessible from Interstate 4 and the Beachline Expressway SR528. This is also the route to Kennedy Space Center and Cocoa Beach.